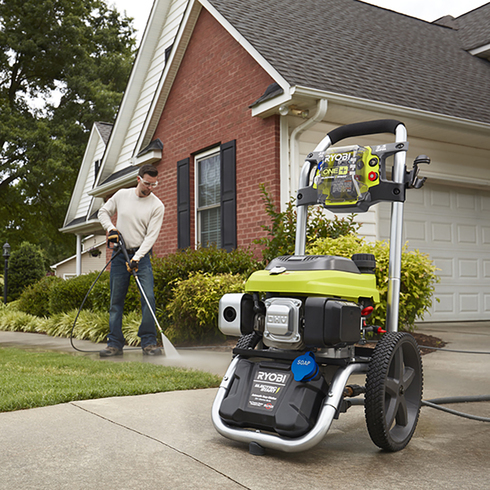 3200 PSI ONE+™ E-Start Pressure Washer is rated 4.6 out of 5 by 69. Rated 3 out of 5 by Kegman from Good Machine Well i want start out by saying that I absolutely love that I can use all of my batteries to start this thing. With that said when I purchased mine it was missing the start switch and I didn't notice it until i gassed and oiled it up making it difficult to return. After 4 hours of research and about 10 phone call Ryobi finally found the part and is going to send it to me. Long story short, buy one that has an engine that you can find parts for and not some off the wall made in japan thing that you can't find parts for. Rated 4 out of 5 by Mitcline from Ryobi - 3200 PSI ONE+ Bought this online two months ago. When it arrived the soap tank was cracked and had to get it replaced as it leaked. Used it to power wash a very large wooden back yard fence. The different spray nozzle attachments worked great. Did a good job washing the fence to remove some heavy mold/mildew. One caution, my friend was helping me power wash and he when he drug the hose that attaches to the wand around to the exhaust side of the power washer he touched the exhaust with the hose and it melted a hole through the hose and I had to go out and buy a new hose. So be care walking around the machine with the hose. Overall the machine worked great. Overall good buy for the price. Rated 4 out of 5 by Quaddad2 from Nice PW with plenty of power, but one design flaw Bought this PW because I wanted lots of power and an electric start. The fact that I already own many Ryobi One+ tools was the clencher. I've used it to clean my entire patio, front porch, sidewalks, and driveway; a total of 6 hours. It starts easily and the noise is minimal for such a machine; about the same as a Honda generator. The flaw is with the gas tank design. There is no visibility to see how much is left and the fill neck is narrow and too close to the handle. Filling it is a bit awkward and slow. Several times it nearly overflowed before I was able to stop. A second "flaw" may be limited to my machine. The choke lever wants to return to the choke position while the washer is running, thereby decreasing the available power. I was able to attach a wire to it to keep it in place and had no further trouble. Overall, I'm very pleased with this purchase. Rated 4 out of 5 by DarrylW from electric start a nice feature I bought this a month ago to clean my back deck of the heavy pine pollen. It did a great job and the nozzle options cover a wide variety of pressure jobs. it is pretty mobile. it would be nice if the hose was a little more flexible. The electric start makes for an easy start even though the switch had apparently was installed upside down according to the usee manual. Just be careful which detergent you use. I purchased a gerneral purpose and also washed my car. It left streaks on my windows that i still am having trouble getting rid of. Overall a nice washer. Rated 4 out of 5 by tom11 from Great Battery Start-up I purchased this washer because of the rechargeable bat. start feature. It is incredible. Also, I am happy with many Ryobi cordless tools that I have. I have used the Ryobi One+ for four projects. I washed a 30' chimney to clean mold from the Vinyl - Great results using suitable wash/rinse cleaner and a 10' extension wand and a jet tip. The pressure hose is very stiff and easy to tangle, thus frustrating. The washer needs an idle-down feature to extend running time due to a small gas tank. The pump seems to lose it's prime too frequently. Rated 4 out of 5 by Iggy3791 from Good power, lightweight and elec start I’ve had gas pressure washers for years. I’ve also had ryobi cordless tools for years. When I saw they had an electric start washer that uses the batteries I already have a boatload of, I was interested. The pressure washer delivers very good pressure and flow. Overall, it’s pretty lightweight and quiet. The electric start feature makes it so much easier and allows my girlfriend to use it too! (Sorry babe) Great package for the price with lots of good features like the onboard soap container. No more hose and bucket to keep up with. Rated 5 out of 5 by Normandrc from Initial issues with GREAT resolve ! I originally purchased this pressure washer in early April for my patio project and other chores. The original order arrived and looked like it was used, and internal packaging disrupted - with the smell of fuel. Concern, I called Home Depot and they gave dollars off. However, then noticed the off function did not work properly. Ryobi proactively contracted me and apologized for the inconvenience and are in the process of sending me a replacement at no charge. I admired their proactiveness with a resolve in order. Rated 5 out of 5 by Kmerc from Great One+ Integration I bought a mixed set of Ryobi cordless tools last year - drill, circular saw, portable light, etc. All using the one+ battery system, so this electric start made a lot of sense. I have only had it for about three weeks, but initial impressions are very good. I'm upgrading from a 2000psi Ryobi electric unit and the additional power is great for cleaning concrete and brick. Operation is very easy and the additional convenience of not being tethered by a cord is nice. Only negative comment I can make is it appears the unit was supposed to be shipped with a battery and a charger which was not in my box. The instructions indicate it should be included but wasn't. Not a big deal as I already have Ryobi battery packs, but something to look out for when you order one. 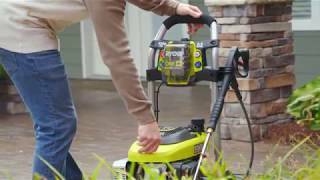 This RYOBI 3200 PSI Pressure Washer is the first of its kind while featuring ONE+ Electric Start. 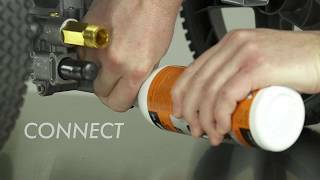 The included 18V ONE+ Lithium+ battery starts up your pressure washer with a simple press of a button – getting you back to work faster and the job done sooner. This powerful pressure washer produces 3200 pounds per square inch of pressure (PSI) and delivers 2.4 gallons per minute (GPM) of cleaning force. This pressure washer is guaranteed to deliver professional results for years to come with a 3-year limited manufactures warranty.